The story took place many years ago in the kingdom of Annam. The ruler of the kingdom, at the time, was a ruthless man who severely mistreated his subjects. The people of the land were unhappy with the king's abuses but remained silent for fear of persecution. Even the king's most trusted adviser detested his tyrannous rule; he secretly devised a plan to teach the king a lesson. It happened that the king owned a rare Siamese cat. He loved the cat so much that he ordered a golden cathouse be made just for the feline. The cat got to live a truly luxurious life. He ate the same delicacies that the king ate, in spite of the fact many people in the kingdom were starving and dying of hunger. He slept on a beautiful silk pillow, while many of the king's subjects were sleeping on the streets. He was always attended by two human assistants, who tended to his every need. Seeing how much the king loved his cat, the cunning adviser used his access to the palace to steal the cat. Once he brought the cat home, he started to train the cat to eat the same rotten food that most people in the kingdom were subjected to. At first, the cat refused to eat the food. After several days without eating, the cat finally succumbed to his hunger and ate the food. The adviser repeated the same training everyday until the cat got used to the new food. Not only that, he had become much more comfortable sleeping on the floor. When the king learned his beloved cat had been stolen, he ordered a kingdom-wide search for the feline. Since this was a rare cat, the search quickly turned to the adviser's home. The adviser was apprehended and brought to the king. Facing accusations that he stole the cat, the adviser fervently denied the charges. He told the king that the cat was truly his cat and not the king's. To prove his innocence, he asked the king to bring out two bowls of food -- one contained the food the king regularly consumed and the other contained rotten food. Without hesitation, the cat chose to eat the bowl with rotten food and not the other. The adviser then asked the king to bring out the cat's favorite pillow. The cat, however, totally ignored it and remained lying on the floor. Since the cat ate rotten food and slept on the floor, the adviser argued, he was definitely not the king's cat who was used to a life of luxury and comfort. Although the explanations were sound, the king still had the adviser arrested and imprisoned. 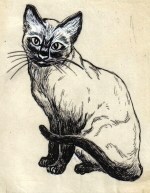 The story of the Siamese cat, however, quickly spread throughout the land. It became a rallying point for the people of the kingdom, who rose up and dethroned the king.